Show current weather, forecasts and much more. have to re-buy WeatherMan from the App Store. Please think of this as a $0.99 paid upgrade. Delete your current version before going to the App Store. 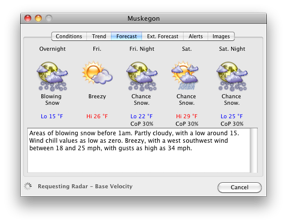 WeatherMan is free for Intel Macs running a OSX version at least OSX 10.4 and OSX 10.6.5 or earlier. 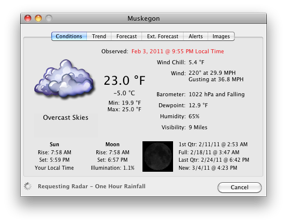 Intel Macs running OSX 10.6.6 can buy WeatherMan for $0.99 on the App Store. Click Here. If you have any question about WeatherMan or any other product please use the support forums or email me direct.